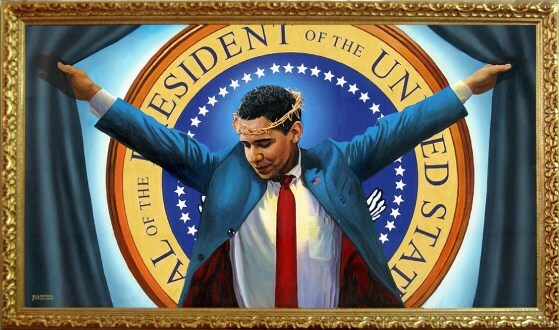 This Picture was Painted by New York artist, Michael D'Antuono, the depiction dubbed 'The Truth' , portrays President Obama wearing a crown of thorns, extending his arms and looking down as Jesus Christ did in crucifix imagery. The painting is on display in Boston. If Mahmoud Ahmadinejad was painted by a christian depicting Prophet Mohammed, would the world not boil? What is your take on this painting assuming you are a christian , will you burn down every painter or have the head of Michael D'Antuono or simply proclaim a crusade?